Like many mothers of my generation, I spend hours of my life on the road: driving my children to soccer practice, music lessons, dance class, and homeschool tutorials. This photo of a highway that I travel every day represents my home in western North Carolina better than a photo of my house. The fact that I snapped this picture with my daughter’s iPhone 5s as my husband drove us to church Sunday morning suggests that I tend to run late — otherwise, I would have had my phone and its invaluable built-in camera with me. 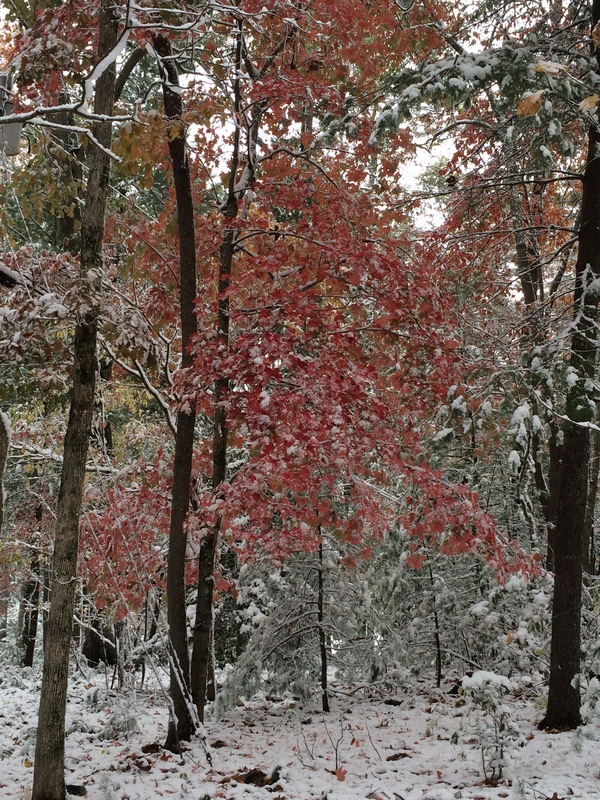 I respond to beautiful sights by photographing them, which is why I borrowed someone else’s phone to capture the unusual sight of fall foliage against snow-capped mountains. What is also apparent to an experienced photographer is how little I know about cameras. I’ve had my iPhone for less than a year, and I am more accustomed to taking pictures with my point-and-shoot Panasonic Lumix or the Nikon CoolPix L320 that I bought on Black Friday. In Photography 101, I hope to improve my skills, particularly my use of light and my understanding of composition. Maybe along the way I’ll learn what “aperture” and “ISO” mean? For a tagline, I currently use the phrase “celebrating beauty in creation.” Better pictures of the beautiful places that I post about would help me show beauty to my readers. 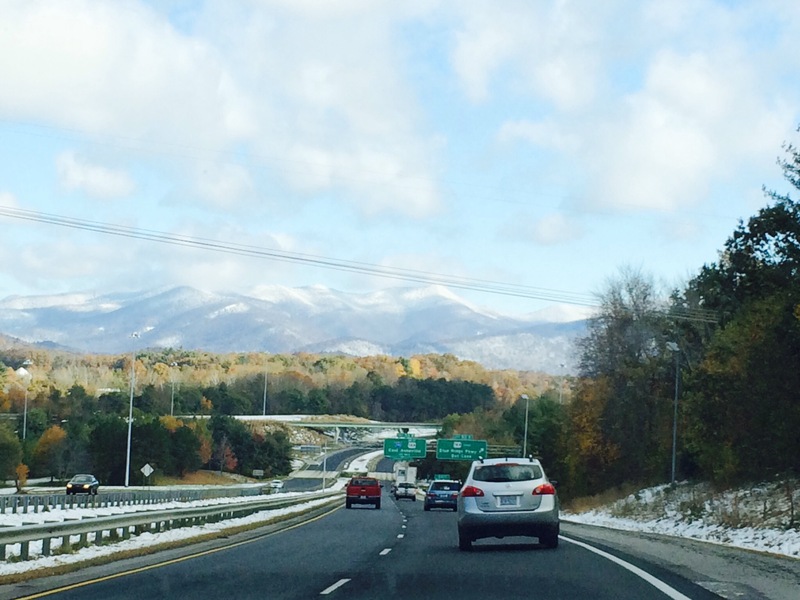 Despite its imperfections, the highway photo hints at how lovely the Blue Ridge Mountains were this weekend, with the golds, oranges, reds, and greens of the trees frosted by an early touch of snow. Within a day, the snowman that my son and husband made had melted. 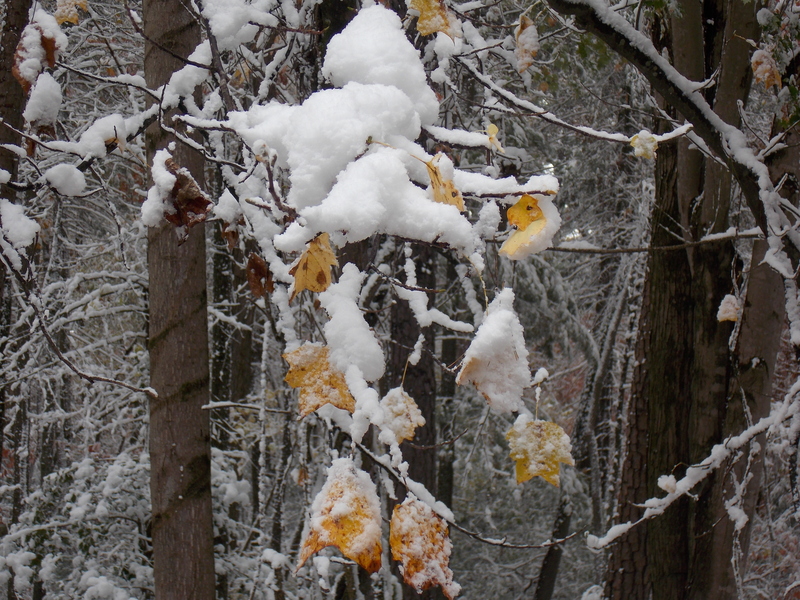 Today, the trees look much as they did before the rare November snow, although more branches have shed their leaves. 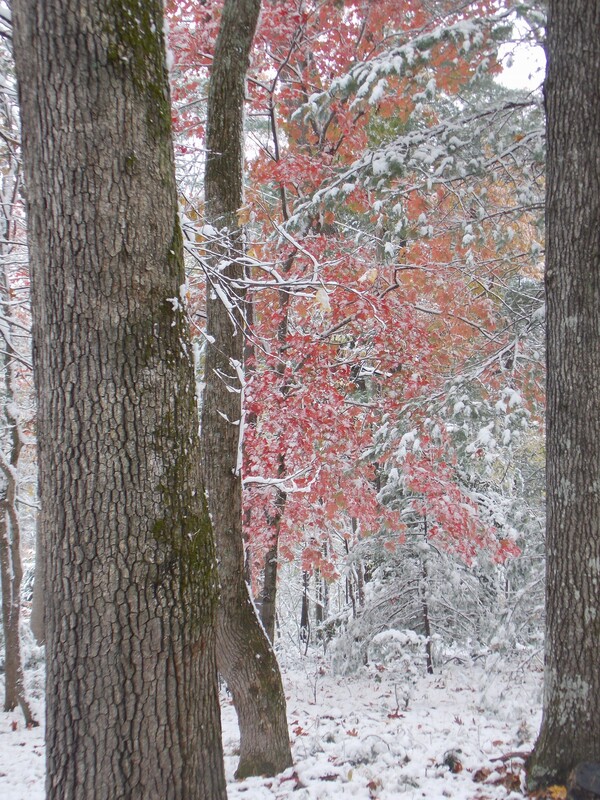 A long, cold winter is predicted for our area, but, for today, the road is clear, and the fading colors of autumn are still beautiful.